Photo from the Grid‘s Facebook page. After three years of operation and dozens of awards, the Grid announced today that it would cease publication as of tomorrow. The Torstar-owned alternative weekly launched May 12, 2011, after the discontinuation of its predecessor, Eye Weekly. “Regretfully, despite a strong and loyal following, we have been unable to generate sufficient revenue from marketers and other sources to fund the Grid’s great journalism,” said John Cruickshank, president of Star Media Group, in a statement. Well, we gave it our best shot. 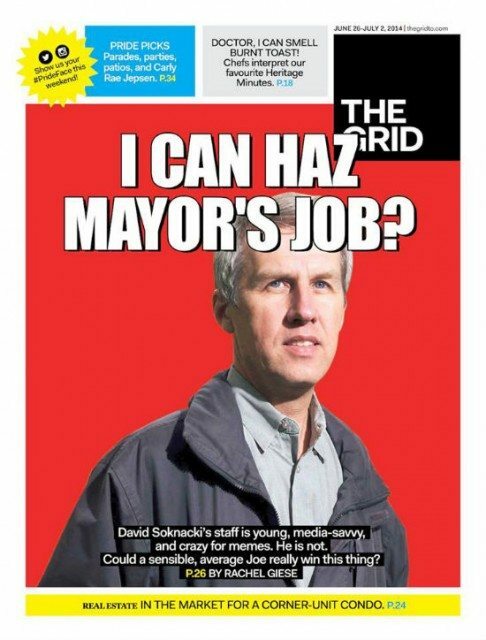 After 162 issues, this Thursday’s issue of @TheGridTO will be our last. We are shutting down immediately. We'd like to thank our incredible staff and contributors and especially our readers for their tremendous support. This city is the greatest. Toronto’s media landscape has lost a vital and valued outlet. The Grid‘s closing will mean that fewer Toronto stories will be told—and the city will be the poorer for it. Tomorrow's issue of The Grid is the last. It has been a helluva lot of fun, Toronto. Don't know if I'll ever have a better gig. Like Windsor when a factory shut down announcement went through. Feel the earth shake a bit under Toronto. Slowly realizing just HOW MANY voices I'll miss off the pages of The Grid. Thankfully most are also elsewhere. Hope they all get picked up.
.@TheGridTO also of course had really great writing and writers. And designers! Was a great looking paper. Huge loss for Toronto.